Lorenzo and Bethany moved to Ferrara, Italy in the fall of 2010. Felt the call that God had put in their hearts to see something start in Ferrara. They watched, as God had gone before them, and in early 2013 a new church plant had begun! 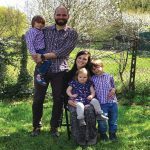 Lorenzo is the pastor of Calvary Ferrara in Ferrara, Italy and his wife heads up the children’s ministry. Together they share the vision for CC Ferrara to see men, women and children discipled, raised up and growing deeper in their walks with God. They have three children named Jaiden, Noah and Abigail.